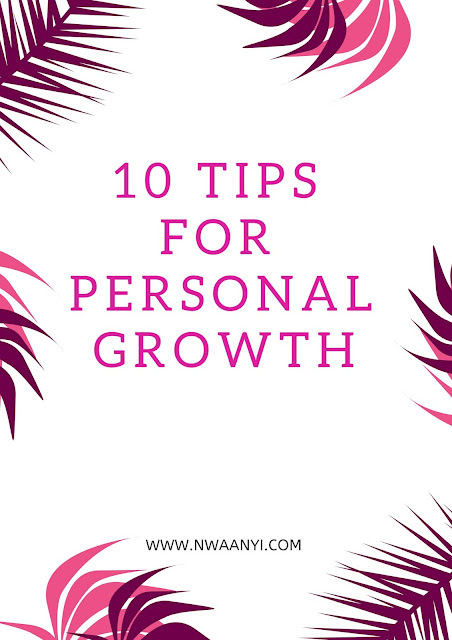 According to wikipedia, personal growth covers activities that improve awareness and identity, develops talents and potentials, build human capital and facilitate employability, enhance the quality of life and contribute to the realization of dreams and aspirations. Phew! This might be the longest sentence in this whole article but I do hope you get the whole idea behind personal growth. Getting rid of bad habits and implementing good ones is a great way to achieve personal growth. Cultivate the habit of spending money wisely, waking up early, being organized and being productive. Goad habits will improve the quality of your life. Yes! In that exact order, chances are if you don't know who are, you're going to have a hard time being who you are supposed to be. Also, you can't love what you do not know. So, how can you love yourself without knowing who you are. Read more about this here! Mistakes can be heartbreaking when they first happen and you catch yourself having one of those "Had i known" moments. Well, even if you didn't know then, know you do. So in order to grow, you must learn from your past mistakes and try not to repeat them again. I really don't understand insecurities but I know everyone has them. There's really no other way to handle insecurities apart from embracing them and confidently showing them off! I used to be super insecure about the way all my teeth and my gums showed when I smiled, I actually tried to stop smiling as much because of that. Long story later, I love my smile a lot and here's a picture to prove it. Goal setting is really important! I spilled all the tea on how to set proper & achievable goals in this article. I'm one of those people that believes that everyone is creative. You don't have to be an artist to be considered creative because we were all born with an innate creative abilities and amazing imaginations. A great way to grow is to work on your creative skills. Don't put all your focus on acquiring material assets. I'm not encouraging you to aspire to be broke, nobody wants that. Materialism makes you greedy and when your mind is always occupied with what you stand to gain, you can easily run into problems. Always put your best foot forward, even when no one is watching. The good thing about doing your best all the time is that you're constantly improving, you might not notice it immediately but overtime you'll see that you've gotten much better. The people around you also notice and you'll be surprised when they hire you or recommend your services because of that! Take good care of yourself. Clear your head. Schedule spa days. Rest and recover! Does drinking hot water & lemon help your skin? A great way to achieve personal growth is to learn new things. This is what growth is really all about. Learn how to do something that is completely unrelated to your area of study or work. Who knows? Maybe it'll inspire a good creative skill you didn't know you had. Personal growth is a really good investment. So get on board with these tips and do more things to improve your life. Thank you so much for reading!